Photo by Dino Petrocelli (www.dinopetrocelliphoto.com). Patients with diabetes who have undergone partial foot amputation are likely to be those most vulnerable to reulceration. Footwear, foot orthoses, partial foot prostheses, and ankle foot orthoses can help reduce that risk while improving function. A pedorthist can help prevent ulcerations and amputations by providing appropriate footwear and custom made foot orthoses. The pedorthist also utilizes modalities like partial foot prostheses and shoe modifications to help protect the residual foot after an amputation. Ill-fitting shoes are a significant cause of skin trauma that precedes diabetic foot ulcers.9 Areas of high plantar pressure and shear – two factors that can lead to diabetic skin ulcerations – are issues that can be addressed with custom foot orthoses. Through use of lower limb orthoses, the orthotist helps restore functional gait after amputation.8,10 Ankle foot orthoses can be utilized to replace the lost lever arm of a transmetatarsal or hallux amputation.8,10 They may also be used as offloading devices to decrease pressure on the plantar surface of the residual foot. While the prosthetist often fits lower limb prostheses for transtibial amputations, he or she also contributes to the care of partial foot amputations – especially in the cases of a Chopart’s or Syme’s amputation. With modern pedorthic, orthotic and prosthetic techniques and devices, partial foot amputees are often able to return to a fully functional lifestyle. Shoe selection is based primarily on function. But it stands to reason that a patient will be less likely to use the proper footgear if they do not like its appearance. If a partial foot amputee has been diagnosed with sensory neuropathy, the upper portion of their shoe should be made of a material that is moldable, stretchable and breathable.14 The interior lining of the shoe is equally important. Shoes are readily available that are lined with materials that wick moisture away from the skin and/or have antibacterial properties. High top shoes work well for patients with transmetatarsal, Lisfranc’s, and Chopart’s amputations as they allow more of the shoe to interface with the foot and ankle, enabling the shoe to gain better purchase on the foot and leg.10 Slip-on dress shoes and loafers should be avoided as they tend to be tight and restricting. Shoes for patients with a partial foot amputation require some sort of closure system like laces or Velcro. An in-depth shoe – one that’s constructed with additional room and a removable insole16 – is preferable when an AFO, prosthesis or foot orthosis is used. Some shoe styles are available in true widths, which means the base of the shoe is proportionally wider as the widths increase. This is not the case, however, with many commercial shoes. Only a shoe fitter with a strong working knowledge of their inventory can guide a patient to an appropriate shoe. A partial amputation foot can be challenging to fit properly. Shoes are designed so that the widest part of the foot rests in the widest part of the shoe. In many cases a partial foot amputation changes which area of the foot is the widest. This may require mis-mating of shoe pairs, with a wider, shorter shoe on the affected side. Figure 1. Pre-ulcer, foot orthosis with shear-reducing material applied to high coefficient-of-friction areas. The first step in reducing shear inside the shoe is to be sure that the shoe size and shape are appropriate for the foot. If the shoe fits and is secured snugly on the foot, the foot won’t shift inside the shoe. Fit is critical since both a loose shoe and a tight shoe can increase shear, friction, and/or pressure on the foot. Another way to decrease friction and shear is to “lubricate” the surfaces moving against one another by using shear-reducing socks made from an acrylic blend fabric or other fiber that has a low coefficient of friction (COF).31 Traditional cotton socks have a relatively high COF, especially when damp. 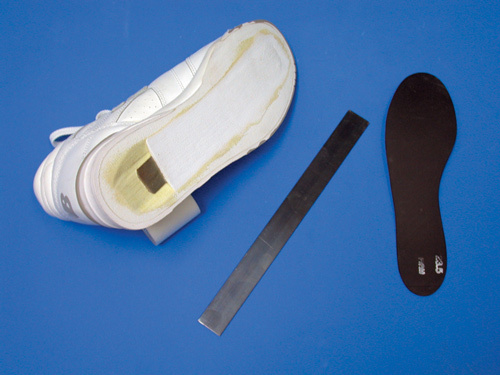 This “lubrication” can also be accomplished by applying a special shear-reducing material to the interior of the shoe or to a foot orthosis or AFO under areas of high pressure or friction. Footwear and insole materials are also a factor in reducing friction. For example, Plastazote – a traditional topcover used in foot orthoses for diabetic patients – has a relatively high COF against a dry sock (0.57) compared to the friction-reducing material ShearBan (0.16). (Figure 1). The peak pressure gradient – the spatial change in plantar pressure around the location of peak plantar pressure – is another pressure variable to consider. It has not been as extensively researched as peak plantar pressure, but it may be a strong indicator of pending skin breakdown. Peak pressure gradient is higher in the forefoot than in the heel even when compared with the peak plantar pressure.32 In theory, a well made foot orthosis should be able to reduce peak pressure gradients if it is constructed to truly maintain intimate, total contact with the entire plantar surface of the foot. Figure 2. Shoe with extended shank inserted, and carbon fiber plate, for use with partial foot prosthesis. There are several types of rocker soles. Selection of the correct shape and type of rocker is based on the foot’s individual needs. Many off-the-shelf walking shoes and running shoes are built with a mild rocker sole. This simple rocker is adequate for a foot that is not at risk of ulceration. Running shoes have been shown to be effective at reducing plantar pressures in the forefoot, providing metatarsal head relief, and gait assistance.38 However, for the patient who has deformity or neuropathy, a custom rocker sole is indicated. A custom-molded foot orthosis can reduce peak plantar pressures in the foot.40-42 Its primary function is pressure redistribution via total contact between the foot orthosis and the foot or residuum. The goal is to decrease areas of high peak pressure. The orthosis is constructed using a soft top layer and a firm, supportive base layer. The contours of the plantar surface of the foot are filled with material and then planed flat on the bottom so that when the patient stands on the orthosis the entire plantar surface of the foot is assuming weight bearing responsibility. A commonly used top layer material for patients with sensory neuropathy is Plastazote. Plastazote – a moldable, static dissipative material – is a nitrogen-charged, closed cell, cross-linked polyethylene foam. Used alone, Plastazote does not have a sufficiently long functional lifespan for use in an ambulatory patient. But when backed with a thin layer of polyurethane foam and/or EVA (ethylene vinyl acetate), it will endure longer under the repetitive stresses of walking. The use of the aforementioned material combinations for foot orthosis fabrication is so common that several manufacturers offer prelaminated sheet stock of them. The base layer of a total contact foot orthosis should be one that is supportive enough to adequately equalize plantar pressures but is still shock absorbing and easily adjustable. Good base layer materials for the total contact orthosis include EVA or cork with a Shore A durometer of approximately 50-60. The orthosis should provide at least marginal plantar pressure redistribution and therefore some reduction of pressure under high pressure points. For more extensive offloading, extrinsic posting can be added to reduce pressure in specific spots, such as a metatarsal head or other bony prominence. For many surgeons, the main objective in an amputation procedure is to salvage as much functional limb that will heal as possible; in O&P, the goal is to preserve and restore the patient’s functional level.8,10 The primary purpose of a partial foot prosthesis in a patient with diabetes is to protect the residual foot, with a secondary aim of restoring normal function and gait. Figure 3. Partial foot prosthesis. The loss of the hallux requires some sort of device to replace the lost lever arm for toe-off propulsion. This can be done either via the use of an extended shank or by attaching a full length carbon fiber footplate to the partial foot prosthesis. Ultimately, foot amputation is not an admission of failure, but rather a chance to start anew. Erick Janisse, CO, CPed, is a board certified pedorthist and orthotist and vice president of National Pedorthic Services in Milwaukee, WI. Dennis Janisse, CPed, is president and CEO of National Pedorthic Services and clinical assistant professor in the department of physical medicine and rehabilitation at the Medical College of Wisconsin in Milwaukee. 1. Harvey D. New, improved Kerraboot: a tool for leg ulcer healing. Br J Community Nurs 2006;11(6):S26. 2. Reiber GE, Vileikyte L, Boyko EJ, et al. Causal pathways for incident lower-extremity ulcers in patients with diabetes from two settings. Diabetes Care 1999;22(1):157-162. 3. Sedory Holzer SE, Camerota A, Martens L, et al. Costs and duration of care for lower extremity ulcers in patients with diabetes. Clin Ther 1998;20(1):169-181. 4. Ollendorf DA, Kotsanos JG, Wishner WJ, et al. Potential economic benefits of lower-extremity amputation prevention strategies in diabetes. Diabetes Care 1998;21(8):1240-1245. 5. International Working Group on the Diabetic Foot. International Consensus on the Diabetic Foot . Apelquist J, Bakker K, Van Houtum WH, et al, eds. Maastricht, the Netherlands: Schaper NC; 1999. 6. Slater R, Ramot Y, Rapoport M. Diabetic foot ulcers: Principles of assessment and treatment. Isr Med Assoc J 2001;3(1):59-62. 7. Owings MF, Kozak LJ. Ambulatory and inpatient procedures in the United States, 1996. Vital Health Stat 13 1998;(139):1-119. 8. Philbin TM, Leyes M, Sferra JJ, Donley BG. Orthotic and prosthetic devices in partial foot amputations. Foot Ankle Clin 2001;6(2):215-228. 9. Reiber GE, Smith DG, Wallace C, et al. Effect of therapeutic footwear on foot reulceration in patients with diabetes: a randomized controlled trial. JAMA 2002;287(19):2552-2558. 10. Rheinstein J, Yanke J, Marzano R. Developing an effective prescription for a lower extremity prosthesis. Foot Ankle Clin N Am 1999;4(1):113-139. 11. Sanders LJ. Diabetes mellitus: Prevention of amputation. J Am Podiatr Med Assoc 1994;84(7):322-328. 12. Mueller MJ, Strube MJ. Therapeutic footwear: Enhanced function in people with diabetes and transmetatarsal amputation. Arch Phys Med Rehabil 1997;78(9):952-956. 13. Mueller MJ, Strube MJ, Allen BT. Therapeutic footwear can reduce plantar pressures in patients with diabetes and transmetatarsal amputation. Diabetes Care 1997;20(4):637-641. 14. Janisse DJ, Janisse EJ. Pedorthic and orthotic management of the diabetic foot. Foot Ankle Clin 2006;11(4):717-734. 15. Mueller MJ. Therapeutic footwear helps protect the diabetic foot. J Am Podiatr Med Assoc 1997;87(8):360-364. 16. Janisse DJ. 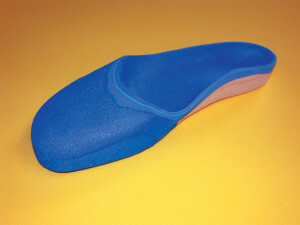 Prescription insoles and footwear. Clin Podiatr Med Surg 1995;12(1):41-61. 17. Harrison SJ, Cochrane L, Abboud RJ, Leese GP. Do patients with diabetes wear shoes of the correct size? Int J Clin Pract 2007;61(11):1900-1904. 18. Pinzur MS, Dart HC. Pedorthic management of the diabetic foot. Foot Ankle Clin 2001;6(2):205-214. 19. Yavuz M, Erdemir A, Botek G, et al. Peak plantar pressure and shear locations. Diabetes Care 2007;30(10): 2643-2645. 20. Armstrong DG, Peters EJ, Athanasiou KA, et al. Is there a critical level of plantar foot pressure to identify patients at risk for neurotrophic foot ulceration? J Foot Ankle Surg 1998;37:303-7. 21. Lavery LA, Armstrong DG, Wunderlich RP, et al. Predictive value of foot pressure assessment as part of a population-based diabetes disease management program. Diabetes Care 2003;26(4):1069-1073. 22. Veves A, Murray HJ, Young MJ, Boulton AJ. The risk of foot ulceration in diabetic patients with high foot pressure: a prospective study. Diabetologia 1992;35(7):660-663. 23. Dahmen R, Haspels R, Koomen B, Hoeksma AF. Therapeutic footwear for the neuropathic foot: An algorithm. Diabetes Care 2001;24(4):705-709. 24. Goldblum RW, Piper WN. Artificial lichenification produced by a scratching machine. J Invest Dermatol 1954;22(5):405-415. 25. MacKenzie IC. The effects of frictional stimulation on mouse ear epidermis. J Invest Dermatol 1974;63(2):194-198. 26. Goldstein B, Sanders J. Skin response to repetitive mechanical stress: a new experimental model in pig. Arch Phys Med Rehabil 1998;79(3):265-272. 27. Yavuz M, Tajaddini A, Botek G, Davis BL. Temporal characteristics of plantar shear distribution: Relevance to diabetic patients. J Biomech 2008;41(3):556-559. 28. Sulzberger MB, Cortese TA, Fishman L, Wiley HS. Studies on blisters produced by friction. Results of linear rubbing and twisting technics. J Invest Dermatol 1966;47(5):456-465. 29. Naylor PF. The skin surface and friction. Br J Dermatol 1955;67(7):239-246. 30. Naylor PF. Experimental friction blisters. Br J Dermatol 1955;67(10):327-342. 31. Dai XQ, Li Y, Zhang M, Cheung JT. Effect of sock on biomechanical responses of foot during walking. Clin Biomech 2006;21(3):314-321. 32. Mueller MJ, Zou D, Lott DJ. “Pressure gradient” as an indicator of plantar skin injury. Diabetes Care 2005;28(12):2908-2912. 33. Nawoczenski DA, Birke JA, Coleman WC. Effect of rocker sole design on plantar forefoot pressures. J Am Podiatr Med Assoc 1988;78(9):455-460. 34. Praet SF, Louwerens JK. The influence of shoe design on plantar pressures in neuropathic feet. Diabetes Care 2003;26(2):441-445. 35. Hansen AH. 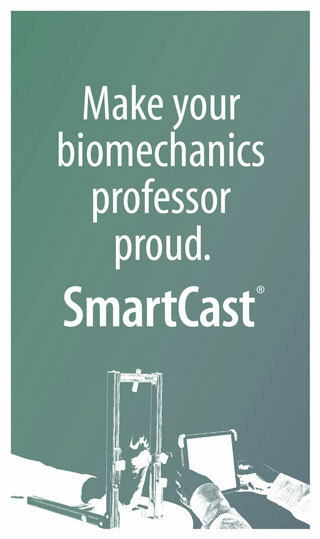 A biomechanist’s perspective on partial foot prostheses. J Prosthet Orthot 2007;19(3S):80-84. 36. Brown D, Wertsch JJ, Harris GF, et al. Effect of rocker soles on plantar pressures. Arch Phys Med Rehabil 2004;85(1):81-86. 37. Hsi WL, Chai HM, Lai JS. Evaluation of rocker sole by pressure-time curves in insensate forefoot during gait. Am J Phys Med Rehabil 2004;83(7):500-506. 38. Perry JE, Ulbrecht JS, Derr JA, Cavanagh PR. The use of running shoes to reduce plantar pressures in patients who have diabetes. J Bone Joint Surg Am 1995;77(12):1819-1828. 39. Marzano R. Fabricating shoe modifications and foot orthoses. In: Janisse DJ, ed. Introduction to pedorthics. Columbia, MD: Pedorthic Footwear Association; 1998: 241-252. 40. Lavery LA, Vela SA, Fieischli JG, et al. Reducing plantar pressure in the neuropathic foot: A comparision of footwear. Diabetes Care 1997;20(11):1706-1710. 41. Tsung BYS, Zhang M, Mak AF, Wong MW. Effectiveness of insoles on plantar pressure redistribution. J Rehabil Res Dev 2004;41(6A):767-774. 42. Viswanathan V, Madhavan S, Gnanasundaram S, et al. Effectiveness of different types of footwear insoles for the diabetic neuropathic foot. Diabetes Care 2004;27(2):474-477. 43. Condie DN, Stills ML. Partial-foot amputations: prosthetic and orthotic management. In: Bowker JH, Michael JW, eds. Atlas of limb prosthetics: surgical, prosthetic and rehabilitation principles. 2rd ed. 1992. St. Louis: Mosby Yearbook; 1992: 403-412. 44. Lange LR. The Lange silicone partial foot prosthesis. J Prosthet Orthot 1992;4(1):56-61. 45. Burger H, Erzar D, Maver T, et al. Biomechanics of walking with silicone prosthesis after midtarsal (Chopart) disarticulation. Clin Biomech 2009;24(6):510-516. 46. Dillon MP, Barker BE. 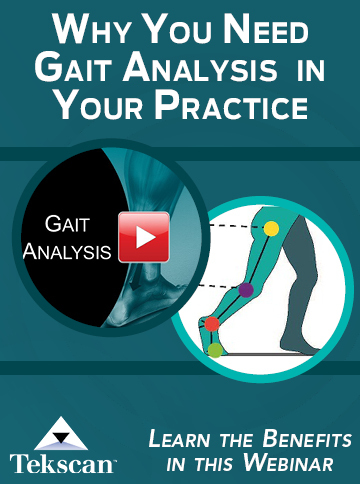 Comparison of gait of persons with partial foot amputation wearing prosthesis to matched control group: observational study. J Rehabil Res Dev 2008;45(9):1317-1334. Is there a shoe suited to protect the foot whilst on the beach, swimming or negotiating rivers whilst out walking. I an currently using a plastic cast-shoe but it keeps slipping off or coming loose in the pool because it does not fit will around the ankle. I need a pool/water shoe to avoid slipping over because my footprint is reduced – as a bilateral mid-foot amputee. A silicon partial foot orthosis is what is required. It is custom made and is like a sock, flesh coloured with toes. It can have various stiffeners and/or gel inside depending on requirements. It can even be made to match the other foot, with veins, hairs, freckles etc or it can just be a foot shape without toes. 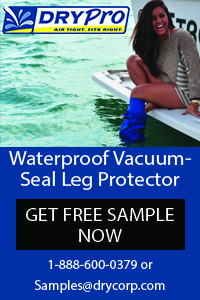 You can wear it without shoes and is great for swimming and beaches.